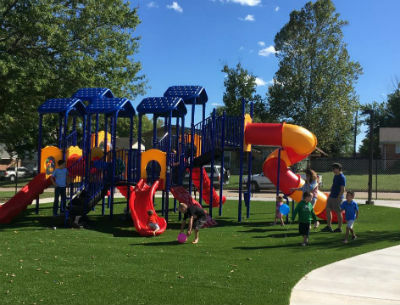 When First Church of God in Sapulpa, Oklahoma, decided to invest in new playground equipment, they received much more than they asked for. William Wimmer, who has served as pastor of the church since 2013, was surprised when a longtime member of the congregation approached the board of trustees with plans for a park, complete with sidewalks, trees, a horseshoe pit, basketball court, soft turf, and sheltered pavilions. Unity Park, a gift from First Church to the Sapulpa community! The theme of community and gathering together also inspired the park’s name. Madden was particularly moved by Psalm 133:1, which reads, “How good and pleasant it is when God’s people live together in unity!” (NIV). John 17, which also speaks of unity in the church, also served as creative inspiration for the project’s official name: Unity Park. Unity Park is also currently hosting Sunday morning donut and fellowship time, as well as serving as an open area for the many children who want to run out and play before services begin. In Sapulpa, Oklahoma, across North America, and around the world, God is on the move in the Church of God. Join the movement. Reach our world. Donate today at give.jesusisthesubject.org. This entry was posted in All Church of God, Central and tagged charity, children, community, donation, First Church of God, gift, kids, OK, Oklahoma, outreach, park, playground, Sapulpa, Velvetta Madden, William Wimmer. Bookmark the permalink.